Will My Bike be Acceptable? Can not have reflectors, pegs, kick stand, or chain guard. (These items can come loose or fall off and cause injury to yourself or a fellow competitor) Bikes with any size wheels (16, 20, 24 or 26) are allowed in the Novice (beginner) class. Your bicycle should be mechanically sound and at least have effective brakes on the rear wheel. If you do not wear a helmet or do not follow proper safety precautions it can be. If you wear your protective gear and follow all safety precautions, it is no more dangerous than any other organized sport. You may sign up on race-day, and register to race that same day. Please bring a copy of the racer's birth certificate. (can be produced after registration) We will supply you with your initial number plate and numbers. If you are really nervous and feel you need a "buddy" to help you get through your first race, ask the clerk when you register for the race to assign you a buddy and let them show you the ropes. Practice the entire track, so that you know what to expect during the race. Practice the gate until you feel comfortable with it's operation. Listen for the announcement that "Motos are posted" and go to the moto boards to find out who you will be racing that day! 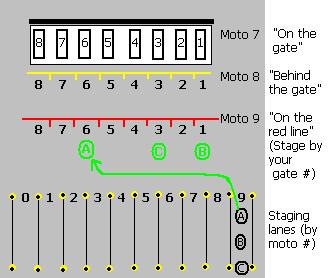 How to read the moto sheets and if you racing someone younger/older than you, understand the moto combining rules. If there is a problem with your moto, go to registration so that it can be corrected. If you hear an anncoment for moto repost. Go check your moto and make sure you were not affected by the change. You will hear the word "PEDAL!" a lot, and you should listen to the spectators and pedal! Always give your best effort and have FUN! There is great joy in riding bicycles, and it is even more intense racing bicycles! Listen for the announcement calling "Riders to go pick up their trophies." If you are entitled to a trophy, go pick it up and enjoy. We hope to see you at the next race.